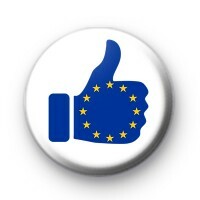 Thumbs Up European Flag Button Badges. This is a listing for a 25mm pin badge with the Yellow & Blue Flag of the European Union & Inside a thumbs up. Are you unhappy and disappointed with the result of the recent EU Brexit Referendum & want to Remain part of Europe then you need some Pro EU Badges to show your support.